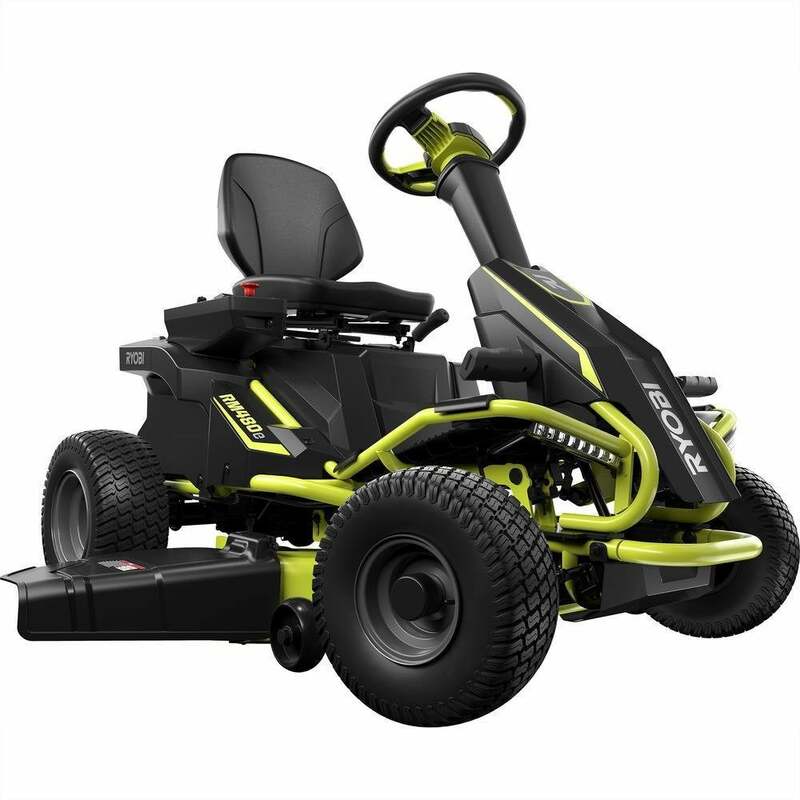 Has the speed, turning radius, and the power to cut through thick grass. Reviews say this zero-turn mower outperforms more expensive lawn tractors in its class. Zero-turn design allows a wide cut in tight spaces. At least one reviewer suggested the owners manual needed more information. Smaller deck size means this lawn tractor mows where others can’t. Classic design and reliable history. 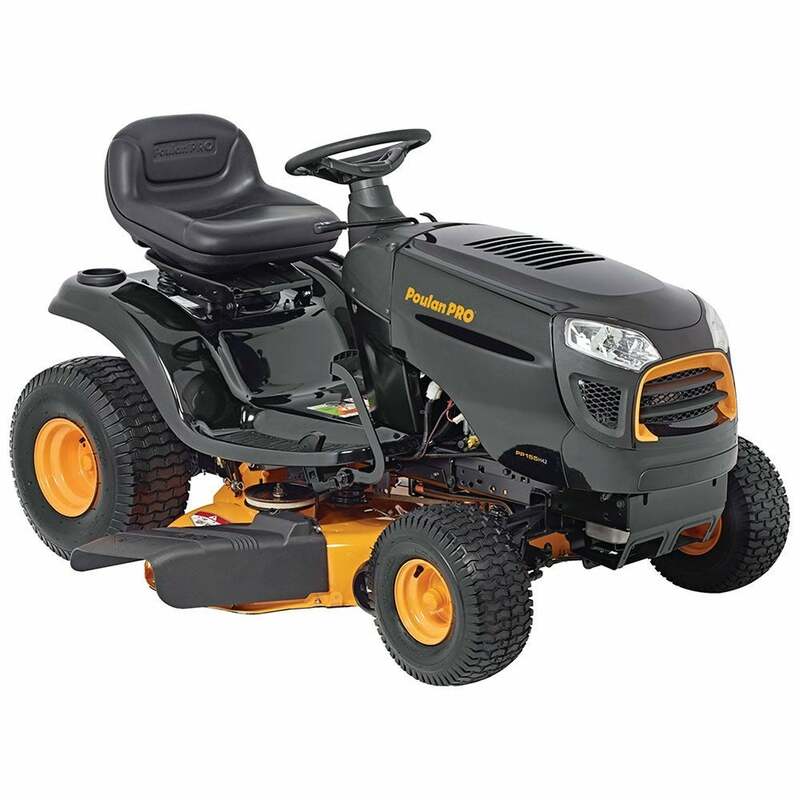 Compact size makes this neighborhood riding tractor great for most residential lawns. Not designed for thick growth or massive acreage. A good fit for those with larger yards without the increased cost of a zero-turn. Rugged design. Praised for its utilitarian design, workhorse performance, and affordable price point. Some reviewers wished for additional creature comforts found on more expensive lawn tractors. The lawn tractor for those with tough jobs. Tackles tight turns, mows thick lawns, and is built to last. Incredible power, wide deck, good turning radius, and excellent cutting ability. Due to its power, this lawn tractor is capable of spinning tires and leaving tracks. A fully-electric lawn tractor. Cuts large yards with ease, without using a drop of gasoline. Electric engine offers the power of gas, without the environmental downsides. Batteries are bulky, and this is a heavy mower. Being electric, cleanup requires compressed air rather than a garden hose. You don’t have a lot of time to research the best lawn tractors. There are hundreds of mowers on the market, and your grass is growing a little taller every day you procrastinate. Unlike purchasing a car, you aren’t allowed to go out and test drive lawn tractors to find the right fit. Luckily, we did hours of legwork, including analyzing a couple hundred reviews, to help you select the riding mower that fits your needs. Lawn tractors are a huge time saver. If you are a homeowner with more than an acre of grass, you’ll quickly tire of walking behind an old-fashioned push mower. Selecting the right mower, however, can also feel like an uphill battle. With all the different models and types, it’s important to pick a lawn tractor that gets the job done but isn’t overkill. After all, most homeowners are cutting grass, not a jungle. In addition to pouring over product reviews to find the best lawn tractor, we also compiled some helpful tips. Follow the review guide below and you’ll be cutting grass in no time. It has all the power, speed, and durability of a professional-grade zero-turn mower, but about half the cost of some other models. For homeowners with more than two acres, a lawn tractor like this is a must. This mower has the reputation of a solid performer. Lawn tractors are a big-ticket purchase, and before taking the plunge, it’s important to understand the features you need. Here are some important considerations. Lawn size: How many acres will you be mowing? If you have a yard the size of a golf course, you’ll probably need a commercial-style zero-turn mower. For those with a small patch of land, a light-duty residential lawn tractor is probably the best fit. Terrain: Hills, ditches, and tall or thick grass demand a lawn tractor with plenty of power. In this instance, there is no replacement for a large-displacement engine. 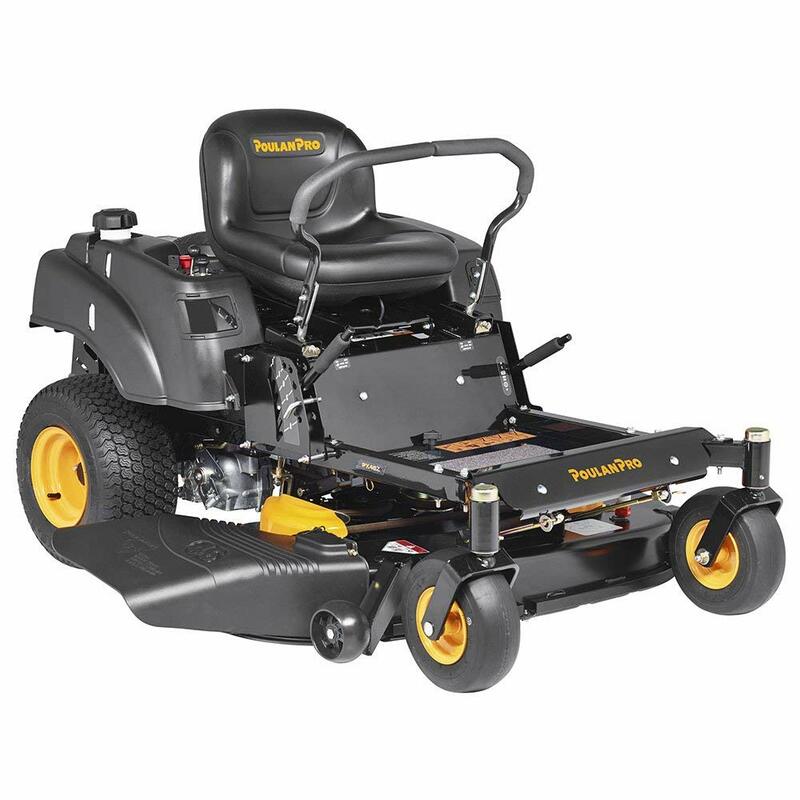 If your yard is rough, you’ll also want a durable mower capable of handling the abuse. Close quarters: A lot of obstacles in your yard? You’ll benefit from a zero-turn mower, which will allow you to navigate around bushes and trees without missing a beat. Price: Some lawn tractors cost as much as a used car. Even if you are on a budget, however, you can purchase a lawn tractor with fewer features that still gets the job done. Before shopping around, know how to speak the language. Engine displacement: An indicator of an engine’s size measured in cubic centimeters (cc’s). Typically the bigger the engine, the more powerful the lawn tractor. Cutting deck: The platform underneath the tractor that houses the cutting blades. Can be raised or lowered to control the grass height. Cutting width: The width of the swath of grass a mower is capable of cutting on a single pass. The wider a mower cuts, the quicker the job will get done. Hydrostatic Transmission: A transmission that uses hydraulic oil/fluid. These systems allow for smoother operation without manually changing gears. Lawn tractor: The traditional design with seat and a steering wheel. These most likely look like their full-sized counterparts on the farm. 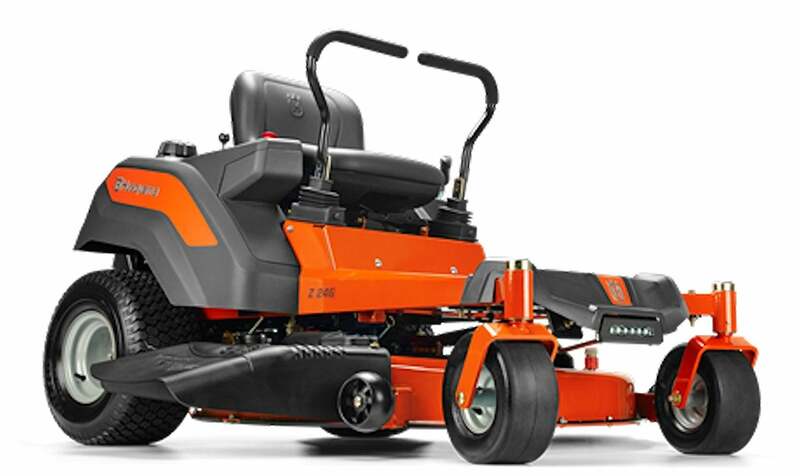 Zero-turn mowers (ZTR): Steered with two handles, these lawn tractors have an extra tight turning radius, making them ideal for mowing around obstacles. Many of these designs are heavy-duty commercial mowers. Electric: Battery-powered lawn tractors that require plug-in charging. These require no fluids and are driven by electric motors. A 30”cutting width means a smaller swath of grass sliced on each pass, but the Troy-Bilt 382cc 30”Inch model is called a neighborhood lawn mower for good reasons. Light, nimble, and maneuverable, the Troy-Bilt is enough for many suburban homeowners. Best of all, this lawn tractor has the lowest retail price of any of our favorites. What is the best riding lawn mower for hills? Ascending hills requires power, so you’ll want a lawn tractor with a large displacement engine, like the Poulan Pro 46” zero-turn lawn tractor. It has a 22hp Briggs & Stratton V-twin engine. Zero-turn mowers use two levers to operate a set of casters on the front wheels, allowing the mower to pivot in a small area. This allows mowing around tight turns and narrow corners. More durable commercial lawn tractors last longer than residential mowers designed for light-duty work. However, nearly all lawn tractors are designed to last many years. Like many automobiles, manufacturers offer warranties. The Husqvarna Z246 zero-turn mower we reviewed has a three-year limited warranty. Ultimately your mower’s lifespan depends on how well it is maintained and whether it is abused. What cutting width do I need? It really all depends on the size of your yard and how quickly you want to get the job done. 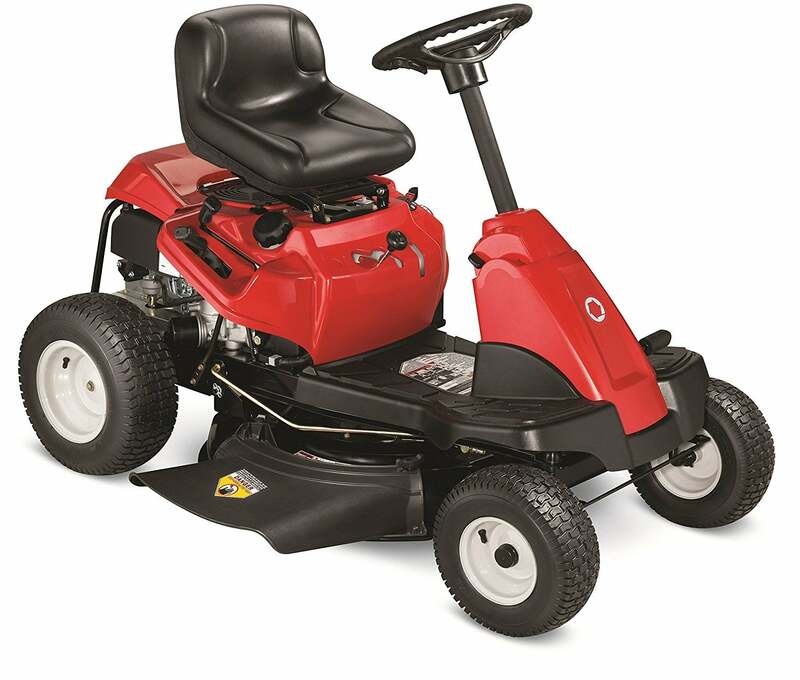 For small yards, a neighborhood mower like this 30”Inch model from Troy-Bilt cuts about a foot wider than most push mowers, but still gives the user room to turn around and make another pass. The best lawn mowers have powerful motors and blades that can cut any type of grass or weed and different cutting options for a more precise trim. View our top picks here. We compared the best weed eaters, including both gas and electric options, so you can get your home projects up and running.